The deadline for submissions for Volume 24 is October 9th, 2018. Please send submissions electronically to appeal@uvic.ca. All submissions must be saved as Microsoft Word documents, and they must adhere to the Canadian Guide to Uniform Legal Citation, 8th Edition (the "McGill Guide"). Submissions may be any length, but a 3,000 to 9,000 word limit is suggested. The Editorial Board will consider the content of a submission and the form of the submission when assessing word limits (book reviews should contain fewer words than essays, as an example). Papers should have been completed while studying at the undergraduate or graduate law student level, and submissions must not be under consideration for publication elsewhere. PLANNING TO SUBMIT AN ARTICLE TO APPEAL? DOWNLOAD APPEAL’S SUBMISSION GUIDELINES. Appeal is an annual publication, published electronically through this website, HeinOnline, CanLII, and LexisNexis QuickLaw. 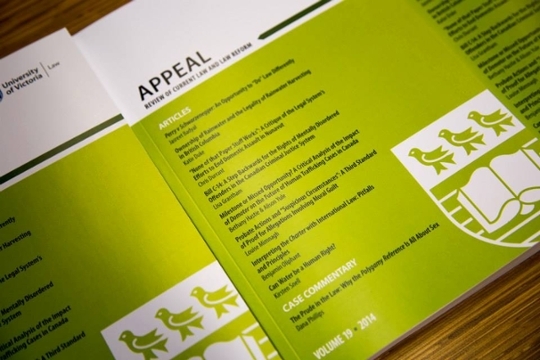 Volume 23 of Appeal was released in March 2018. WANT TO READ APPEAL? DOWNLOAD VOLUME 23 (2018). Print subscriptions are available for CAD20.00. To subscribe to Appeal, email the Editorial Board at appeal@uvic.ca.